The Clear Spring School where I teach wood shop got its first technology grant in the early 1990's from Apple. According to hype, computers were, after all, going to upset a few things, and schools that did not jump on the bandwagon would be setting their children back by decades if not worse. 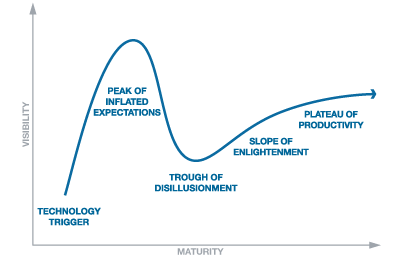 The chart above is of the Gartner hype cycle, and is remarkably similar to the Dunning-Kruger effect in its shape. It has been noted that the peak of inflated expectations (and its more grueling aftermath) exactly corresponds with the shape of the mount of stupidity. The problem with human beings seems to be that we rush ill-considered into whatever is new in order to lay claim generationally to a sense of agency in the world. 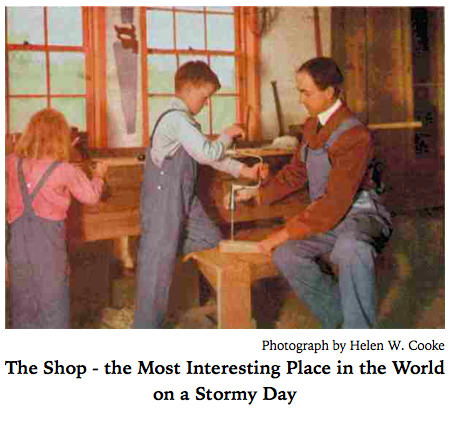 For instance, the new maker movement largely ignores the rich history of shop classes that built our nation and helped millions of students to find a meaningful place in school and in life, and as a consequence ignores also the rich pedagogy of hands-on learning that would have been available to them from Educational Sloyd. frequent use of computers in schools is more likely to be associated with lower results. In other words, over the last twenty-plus years of computers growing their way into schools, the hype has grown but the performance has not. My thanks again to David for sending the link: Computers 'do not improve' pupil results, says OECD. It should be noted that rushing to technological solutions in education may be expensive and will likely fail to deliver expected results. One of the interesting things that should be noted about digital technology is that its intended to make things easier and easier, when children really need to do real, difficult and challenging things that build both character and intellect at the same time. 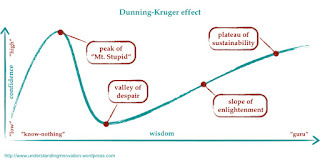 In support of yesterday's post referencing the Dunning-Kruger Effect and the "peak of mount stupid," Joe sent me a link to an article in the The New York Times telling that schools are graduating students at a higher rate, but that those students are ill prepared for college or for life. If you study the graph shown in yesterday's post, you can see why educatonal policy makers are reluctant to make significant changes in schooling. The valley of despair is deep and the descent from mount stupid is abrupt and would seem cataclysmic for those peering over the abyss and the long efforts required to ascend to more effective schooling. My boxes, on the other hand, now have pulls attached and are ready for finishing when I have a nice day to do it. the peak of mount stupid. only recognize and acknowledge their own lack of skill, after they are exposed to training for that skill. Although the Dunning–Kruger effect was formulated in 1999, Dunning and Kruger have noted earlier observations along similar lines by philosophers and scientists, including Confucius ("Real knowledge is to know the extent of one's ignorance"), Bertrand Russell ("One of the painful things about our time is that those who feel certainty are stupid, and those with any imagination and understanding are filled with doubt and indecision"), and Charles Darwin, whom they quoted in their original paper ("Ignorance more frequently begets confidence than does knowledge"). Geraint Fuller, commenting on the paper, noted that Shakespeare expressed a similar observation in As You Like It ("The Foole doth thinke he is wise, but the wiseman knowes himselfe to be a Foole." By sheltering kids in schools from doing real things, we build their confidence on what has been called the peak of mount stupid. We also squelch their interests in further learning at the same time. The second chart shows the gradual rise in confidence level of American students from 1965 to 2010. As students have done less and less real in schooling, as wood shops, music and laboratory science have been cut, confidence has been sent on a steady rise. 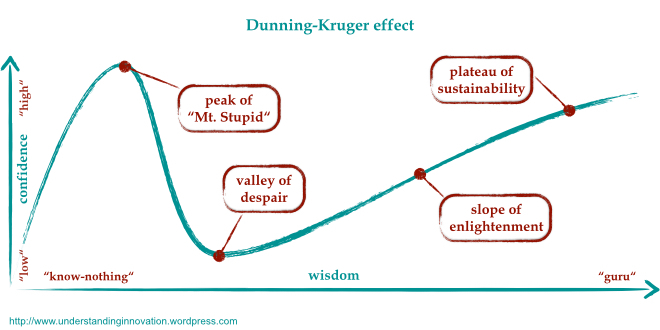 But in light of the Dunning-Kruger effect, is that a good thing? In my wood shop today, I plan to finish boxes. Here in Northwest Arkansas we are in our third day of a predicted deluge. Highways were flooded yesterday and the rain continues today. Roads have been washed out, and highways flooded as bands of rain have cycled through our area one after another. This has been interesting to me, in part, because three days before this event, computer models had warned what we were in for, and the advances made in climate science, helping man to understand and predict weather are clear cut. Even the staunch conservatives who deny the effects of global warming, do so at the risk of making fools of themselves. How dare they deny the credibility of climate science and still make use of the weather information available at hand on their iPhones? What can they say when their policies of obstruction of scientific understanding have resulted in cataclysm? Oops, Maybe? We pay a heavy price for our schooling. It's not what it costs in terms of teachers and buildings, but what it costs in failure to engage students and stimulate inquiry among all students. I explained this in an earlier post during the 2009 presidential campaign, Why jp aint smart. But I'll try to quickly explain it again. Our current model of public schooling denies the value of student inquiry, and pushes children through the process of schooling without regard to their readiness for inquiry. It culminates in students who do not know the process of sifting through data to discover truth, and insists that belief is enough. Friedrich Froebel's Kindergarten was not about just giving children what they needed to pass on to the next level. It was about helping children to connect with and understand the whole of life, and their relationships to the worlds of nature and of man. And when we tally the true costs of our educational model, we must take into consideration the opportunity costs of what American educational policy makers chose to ignore. In my wood shop during these rainy days, I've been making boxes, finally adding pulls and routing the bottoms. I can finish sanding and begin applying Danish oil today, but will likely wait for a sunny day when I can either open the windows or set up to work outside. Yesterday I cut the lids off 32 boxes after sanding them smooth with the random orbital sander. Then I installed hinges in each. There is a direct relationship between the techniques I use to teach and the production techniques I use to make boxes efficiently to a high standard. In classes, I don't want my students standing in line when they could be box making. In the shop, I want to make money and exercise my mind and body in the most efficient manner possible. The same techniques can be useful in both circumstances. The photo above shows my latest improvement of technique. Small blocks with strips of the same thickness as the saw kerf keep the box from closing on the blade as the lid is cut from the body of the box. Over the years I've practiced a number of different techniques for this, but this is the latest, and allowed me to get boxes done much more quickly and safely than in the past. As cuts are made the blocks are put in place. For the last cut, all three blocks will be in position to hold the lid and body of the box with just the amount of space between for a near perfect cut. One of the things that will be talked about during the presidential campaign will be the need for all children to attend preschool as a precursor for Kindergarten and regular schooling. The following is from the Atlantic article, "The New Preschool is Crushing Kids"
Step into an American preschool classroom today and you are likely to be bombarded with what we educators call a print-rich environment, every surface festooned with alphabet charts, bar graphs, word walls, instructional posters, classroom rules, calendars, schedules, and motivational platitudes—few of which a 4-year-old can “decode,” the contemporary word for what used to be known as reading. Because so few adults can remember the pertinent details of their own preschool or kindergarten years, it can be hard to appreciate just how much the early-education landscape has been transformed over the past two decades. The changes are not restricted to the confusing pastiche on classroom walls. Pedagogy and curricula have changed too, most recently in response to the Common Core State Standards Initiative’s kindergarten guidelines. Much greater portions of the day are now spent on what’s called “seat work” (a term that probably doesn’t need any exposition) and a form of tightly scripted teaching known as direct instruction, formerly used mainly in the older grades, in which a teacher carefully controls the content and pacing of what a child is supposed to learn. But what researchers are finding is that the teacher driven regimen and control robs children of self-directed play time leading them to shut down their receptivity, causing them to resist or even hate schooling. What educational policy makers must be forced to understand is that there is a difference between learning, and being taught. All children love to learn. Only under the best of circumstances can being taught, and learning coincide. And that must begin with the interests and cooperation of the child. Where that interest is lost or never gained, children are forced to suffer through.Where students and teachers are placed in coercive environments children rebel and resist in patterns that may last life-long. It is difficult for me to understand how folks could sit around being passively entertained when they could be making beautiful and useful things, but schooling is good at preparing you for that. You won't learn anything new by watching football, but you will in the wood shop. Today I will add lift tabs to the lids, sand a bit more, rout edges, and begin the final finishing process. As a result, lovely boxes will be available for sale or to give as gifts. If I were watching football, I would have no new boxes and no new skill to show for it. My wife and I have friends who have been adjusting their lives to fit the dog they got as a puppy about 7 months ago. It is a beautiful dog and loving and large, but it is also of a hunting and tracking breed that was carefully engineered to its specific purpose. It is a hound capable of going great distances in the pursuit of game. That means of course, that the dog loves to follow its nose and run towards trouble. It's not a bad dog. It is doing what it was designed to do whether its owners are in agreement at that moment or not. Some additional training will help, but do you purposefully crush the spirit of the dog you love, or can adjustments be made on both sides? Boys ever delight in being occupied in something for the youthful blood does not allow them to be at rest. Now as this is very useful, it ought not to be restrained, but provision made that they may always have something to do. Let them be like ants, continually occupied in doing something, carrying, drawing, construction and transporting, provided always that whatever they do be done prudently. They ought to be assisted by showing them the forms of all things, even of playthings; for they cannot yet be occupied in real work, and we should play with them. There will be those who will argue that boys, having been neutered by technology will not longer be the boys Comenius observed. Can that truly be the case? My friends could collar their dog with an electronic device that would administer an electric shock when it nears the border of their property. They have chosen a more adaptive and humane course. In the case of boys, the use of drugs to control behavior is at an all time high. Today in the wood shop, I will be sanding boxes. It seems that I, like a dog, have been engineered toward specific things. So today my boxes are ready for more sanding and for cutting the lids loose so they can be opened and shut. A crop of veneered boxes, ready for next step. Kindergarten has been called the "new first Grade" as the educational standards movement has tried to usurp play time with reading, math "and school readiness" training. Preschool has been suffering the same effects. According to an article in the Atlantic, The New Preschool is Crushing Kids. A major evaluation of Tennessee’s publicly funded preschool system, published in September, found that although children who had attended preschool initially exhibited more “school readiness” skills when they entered kindergarten than did their non-preschool-attending peers, by the time they were in first grade their attitudes toward school were deteriorating. And by second grade they performed worse on tests measuring literacy, language, and math skills. The researchers told New York magazine that overreliance on direct instruction and repetitive, poorly structured pedagogy were likely culprits; children who’d been subjected to the same insipid tasks year after year after year were understandably losing their enthusiasm for learning. That’s right. The same educational policies that are pushing academic goals down to ever earlier levels seem to be contributing to—while at the same time obscuring—the fact that young children are gaining fewer skills, not more. How do children gain skills? By doing real things, not the "same insipid tasks year after year!" But insipid tasks is what schools are known for. If Kindergarten which once relied upon play to ready the child for life, is now the new first grade, and preschool is to ready children for a Kindergarten that no longer resembles what it once was, when will children be readied for life? Yesterday in my woodshop, I cut keyed miter slots in the corners of boxes and installed contrasting keys to strengthen and decorate the mitered joints. Today if it was not Christmas day, I would be in the shop sanding the sides flush and smooth and cutting the lids from the bodies of the boxes so that hinges could be installed. Do people not know that creativity begins at the earliest days of childhood and that it can be drowned in school? My thanks to Mario for forwarding the article. It truly amazes me that educational policy makers would be as ignorant as they are. But the reasons are clear. The further you get from the hands, and hands on, the further you traipse from reality. Make, fix, create, and encourage others to change the system so that others can learn likewise. I have been busy playing in the wood shop by finishing projects I'd started and failed to complete. For instance, the tiny tiner shown above are now lidded, sanded, finished and ready to sell. I now have over 30 larger boxes that have veneered panels in the lids, and that are ready now to have miter key slots cut and contrasting keys glued in place. I can just keep whittling away each day. And while I'm not sure what to do with all this work, there is pleasure in it. One of my students from Marc Adam's School of Woodworking sent photos of some recent work. The class he took was intended to help students take their box making to the next level. During class Rich worked on boxes for wine bottles, and you can see that he has certainly achieved high levels of design and craftsmanship. The boxes he made were to give as gifts, so I think you can see how he made best use of the holiday season as an excuse to refine his own skills. I showed photos of my box guitars to editors, and one is interested in a book about making them. It would be a short book, featuring only 6 instruments and show variations in how they can be made. It also promises to be a book that will only take a few months of my time to produce, but will allow me to be of some further use. Yesterday I received a small package from Portugal containing 100 5/16 in. diameter cork balls to experiment with in sticks and peas, Froebel's 19th gift and the Kindergarten exercise that launched Buckminster Fuller's interest in architecture and engineering. My play with this gift to myself is shown in the photo above, and is one of the last non-editorial steps in completing my book on Froebel's Gifts. Who would have thought such a simple thing could have such a profound effect on human culture? I am in the process of using the cork balls and toothpicks to build a bridge-like form, but I have to mention that this kind of thing is not easy, and would not have been easy for children if their hands and fingers and minds had not been made nimble by the earlier gifts. In the wood shop, I have been chasing loose ends and applying my time in various directions. I have an order from my wife for business card holders to be completed for her to give as gifts. Those and small bentwood boxes will be finished today. I also glued up three guitar necks to use with the box guitars I'm making, and have nearly settled on a bridge design for one. That one is nearing the point of being strung. Make, fix, create, and extend to others the joy of learning likewise. Douglas Hofstadter is a clever man, and his book mentioned in the quote above can help to explain academia and academic pursuits in that actors create meanings that may or may not have reference to reality, that are nonetheless meaningful to the actors involved. Escher's hand drawing a hand, drawing a hand is the perfect visual metaphor for the pursuit of academic learning. So your can get your degree in some arcane area of didly squat and never even know how to make a box. The boxes shown in the photo above are the start of three box guitars. Two are rectilinear, and the other is what I call a K-Body due to its resemblance to the letter "K". The challenges for our industry started quite a while ago. Every politician that wants to make a name for himself messes with public school funding. The trend in high schools is to try to send every graduate to a university. When the funding is cut to the schools, the programs that are not viewed as academically rigorous are the first to go. All industrial arts classes are expensive and take up a lot of space. Unfortunately, these classes have the perception of being geared more toward the academic underachiever. The concept that these students may learn differently or gain self-esteem by actually making a tangible product doesn't get taken into consideration. The way Hofstadter's law fits in is that we began the Wisdom of the Hands program at Clear Spring School in 2001, and I started this blog in 2006. We may be making slow progress in reshaping how manual arts can fit in to the overall development of each child. Still, this is taking much longer than I thought. On a related matter, children need to play, and eat healthy foods, in addition to making things in wood shop. The idea that children should be confined to desks for more than 15 minutes at a time is idiocy, pure and simple. In a recent article in National Geographic, the author was describing the effects of global warming on the people of Greenland. The most dramatic effects of Global warming are quite clear to those who are observing the loss of glaciers and sea ice, and it would be a good idea to banish our current crop of GOP leaders to a remote isle in Greenland where they could learn first hand about what our fossil fuel dependency has done and is doing to our planet. If the GOP leaders didn't want to face the cold of Greenland, we could send them to the Marshall Islands where they could watch the waves of a rising sea lapping at their feet. In the article, a particular hunter is described as having a PhD in the natural environment, but of course the author was not talking about a real PhD degree which would be meaningless in Greenland. He was using a term common to readers to describe, metaphorically, an advanced state of understanding. But what is a PhD in reality, if it is not derived from an understanding of the real world? The penultimate degrees are generally granted to those who have attained mastery of a high level of abstraction. With school out for nearly two weeks I continue to clean shop. I am gradually finishing boxes that were started months ago. Last night I cut linings to fit the bottoms of several boxes. I feel a compulsion to use what I know to create and share. I am finishing one guitar and am starting three more and I am planning to use the mask above from Richard Bazeley's class as my model for the design of the body of one guitar. In my reading of Matt Crawford's book, the World Outside Your Head, I am on chapter two where he is describing embodied cognition, a subject I've described here in the blog many times. Schooling at all levels suffers from an overly narrow definition of mind, and a failed perception of who and what we really are. Extend that into society at large and you begin to understand why politicians can lie, be believed, and get away with it. Make, fix, create, and instill in others the love of learning likewise. I spent most of the day yesterday cleaning in the wood shop, building a scrap rack to organize waste wood for burning in the wood stove, and hauling logs from the woods with my tractor. Some of the logs are for firewood, and the others will be milled into lumber. I took just a few minutes for therapy, finishing tiny tiner I had started during the photography of my Tiny Boxes Book. These Scandinavian inspired bentwood boxes have lift lids. Further sanding, and application of finish will make them complete. I am amazed at how much scrap wood has accumulated since the last time I so thorough cleaned shop. If the amount of scrap is any indication of my production, I have been a busy man. The sawdust bin in my shop is also full and I'll empty its contents today and compost it to build the soil in the forest around the house. I am reading Matthew Crawford's new book, The World Beyond Your Head. My local librarians ordered a copy when I told them that I was quoted in it, and when I went to pick it up, I learned that they had photocopied the last two pages of the book to keep at the desk and share with other library patrons. I seem to be a very minor local celebrity. The first chapter of The World Beyond Your Head enters the subject of attention and how our powers of attention have been eroded in part by our digital devices but also surrendered to those who would manipulate us toward their ends. Attention(when it is manipulated by others) is the way through which individuality and personal creativity are lost. In that regard, I seem to be one of the very few on the planet not totally immersed in the Star Wars phenomenon. Even presidential candidate Hillary Clinton finished her closing remarks with "may the force be with you." Clever but dumb in my humble opinion. As a craftsman when the first Star Wars episode first came out, I had plenty already going on in my own life, and regarded the over the top exuberance of my peers as a warning of sorts. Developing the powers of attention is not specifically targeted as a value in schooling. Our industrialized economy is dependent on industry's ability to coerce attention toward the acquisition of devices and objects that we do not need, and that simply further complicate our lives in ways that serve their interests. In any case, we are down to the wire now for ordering things from my Etsy store if you want them to arrive in time for Christmas. Orders placed by Monday for US delivery will likely arrive before Christmas Eve. When I made a very brief visit to North Bennet St. School in Boston in 2001, talking with their development director opened a crack in my understanding, that then, as I began to pry things open, revealed what should have become clear to American educators, but for the fact that humans must be drawn (commanded even) to look deeply and closely enough to see beyond the surface of things. My student Oen, second grade, wanted to make a wooden sword just like one made by Hannah, one of my older students. He looked at the two parts of the sword, the handle and the blade, and taking two pieces of wood, proposed that they could be glued. Putting Hannah's sword before him, I asked, "look closely at how it is made." Only by looking closely and examining the intersection between the handle and the blade, could he see that the end of the blade was whittled down to enter a hole in the handle that gave a strong connection between the two. In order to make what he wanted he would have to drill a hole in the handle, and then shape the end of the blade to fit in that hole. Making the sword was a whole lot more work than he imagined it would be. But knowing how it needed to be made, allowed him to actually make one that would work and would last. The most important point, however, was not Oen's making of the sword, but his having taken the time to look closely and learn from an examination of the real world. For a second grader, this is how progress is made. I am training Oen, not only to make, but to see. Understanding Educational Sloyd is not quite so easy. One can look at a progression of models to be made by students using certain tools, with each to be made at a certain time in relation to each other. What one does not see is the underlying theory upon which the progression was planned. An immediate hunger to develop skilled hands for industry led the early manual arts movement to rush forward without a deeper understanding of how it fit in. In the US, proponents of the manual arts squabbled from the outset over whether Sloyd models would be used in progression, or whether, following the Russian system of Victor Della Vos, exercises unrelated to the making of specific useful objects would suffice. Educational Sloyd, to its disadvantage, was a far deeper subject than simply fitting hands to industrial purposes and what they missed was the deeper view of how children learn, and must learn in order to be most deeply engaged. Educational Sloyd explained how all children learn and explained the necessity that all children make beautiful and useful objects, but in a society bent on maintaining the pre-existing social stratification, and the separation between the intellectual class and working class, the more narrow view of manual arts won out. Now, in the US and in the world, there is a growing excitement about making things, and maker labs are being formed in schools, and of course that is all a good thing. Kids of all ages need to do real things. But what is still lacking these days is the adoption of a theoretical foundation concerning how and what children will learn from the experience and how it fits into their overall schooling and development. Otto Salomon, in Educational Sloyd developed and promoted a theoretical foundation for manual arts that carried an understanding of how students learn, and how we might best teach. 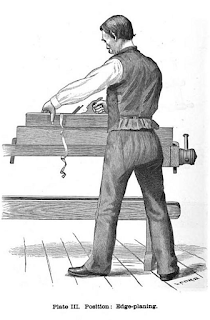 That theory of Educational Sloyd, and the understanding buried at the point where the blade and handle are conjoined should have been observed and adhered to throughout schooling, and not just in the manual arts. But just as Oen saw the handle and the blade as separate things that he could stick together with glue, the new maker movement will rise only to fall again, if we don't drill the hole in the handle and shape the tang of the blade to fit. This is precisely why Educational Sloyd has even greater value today. While folks are looking for educational reform, the Theory of Educational Sloyd holds the key to effective change. Make, fix, create, observe, and encourage others to love learning likewise. Yesterday we had the holiday program and pot luck at Clear Spring School and it was warm enough for it to be held outside. Unusual for December. I plan to use the holiday break to clean my shop, finish boxes and continue making experimental cigar box guitars. The photos are of my "wild man" guitar which explores the use of an oversized top. The idea is that the top can be expressive without changing the underlying box shape. This idea will help my student do more expressive and unique work. The idea of this guitar is that the sound holes form eyes, the curved parts below below the body are like mutton chops. The bridge will form the mouth. The tail piece is made just as I've made them in the past, with galvanized sheet metal and screws. I am stamping the name of each guitar in this series using metal stamps. We are getting down to the wire on shipping from my Etsy store. Shop now if you need a gift in time for the holiday. Because making is not confined to usual business hours, you now have about 150 hours remaining in which to make gifts before Christmas. Make, fix, create, and extend to others the love of learning likewise. I am at work on my second guitar in this series, and the photo shows the simple way in which the neck is attached to the body of the guitar. In fact, the whole construction is relatively simple. I've made the sides of the box with nails and 1/2 in. thick strips cut from 2 x 4 lumber. In the photo I'm using spring clamps to hold the back to the sides. A long screw is used to attach the neck and then two smaller screws are used to keep the neck from twisting and to provide additional strength. You can see that I don't trust the softwood to have enough strength to hold the screws, so I have used an oak block glued to the inside. Once the front of the guitar has been glued in place, additional strength is gained. With the relatively wide stock glued to the panels at front and back, some resistance to twisting and warping results. You can see the faint line down the front panel of the guitar that I've used to make certain that the design of the front matches the placement of strings. Today is a performance day at Clear Spring School and our last day of school before the winter holiday break. We've but 8 days of making time before Christmas. but it is better to give something you've made yourself late, than to buy and give meaningless stuff. When you make it, it gives three times. First it gives you pleasure and skill in the making. Then it gives pleasure to the person you made it for. Then it gives again, as your community is enriched by the skills and caring of its inhabitants. If you want to buy a wooden box, go to my Etsy store. A friend of mine, Zeke Leonard, has been making a variety of musical instruments, among them "canjos," which he recommends as the first instrument a child could make or that you might make with your child. It requires a stick, a can, a few screws, a guitar string and a tuning peg. The tools are simple. A drill, a screwdriver and a nail. I have been sending students home with their bows and arrows, and hopefully their neighborhoods will not be terrorized as a result. It would seem (if you watched the Republican debate) that Americans are terrified by Muslims, but perfectly at home in their obsession with guns. It all comes down to who's doing the shooting, I guess. Yesterday I finished the neck for yet another cigar box guitar, and I should be able to show the design of it later in the day. It is amazing that a real guitar can take weeks, but a cigar box guitar can be made in days or hours and when used as a caterwauling device, still provide the opportunity to drive your neighbors insane without the use of a gun. I also finished two small boxes to give as gifts to family. Yesterday we made a delivery of toys made by Clear Spring School kids to our local food bank. It is simply important that children understand that they can give to others, and that what they make can make a difference. The food bank was busy as it always is on Monday mornings, but the director took time to look at the toys, ask questions about how they were made, and to let the kids know that what they've made will be enjoyed by others. Others in school are taking their bows home in advance of the holidays, beginning to make cigar box guitars, and working on independent projects. In my work shop, I'm working on a box to be used as a prop in a product review for Fine Woodworking Magazine. In school, I'm working on the neck for a second cigar box guitar. By doing my own work, I hope to show my students how their own work can be done easily and well. We have 10 making days between now and Christmas, but not all holiday giving will be done on that one day. My Etsy store has boxes that I've made with my own hands and delivery in 2-3 days. Yesterday, I was able to attend a concert and book signing celebrating the guitars and musical instruments made by Ed Stilley. His guitars violated nearly every rule in the luthier's book. He used all the wrong woods and ignored nearly all the common techniques. Inside his guitars and violins you will find springs, and rods, sawblades and chain saw sprockets, all connected to convey vibration from the neck. Inside the neck below the third fret, he placed an invention of his own that he called "the jingler." It was a small metal part that was intended to make the neck rod vibrate thus creating extra resonance. His instruments are heavy, weighted down, first by his choice of dense woods like walnut and oak and then by the load of metal parts he put inside. His frets were often misplaced, as he knew nothing about the math involved, and marked their placement in pencil and cut them in place using a two bladed hacksaw. As a result, many of his instruments are difficult to play. But they were made with love and given free. I'm not sure what more needs be said. Today our Clear Spring School kids will deliver the toys they have made to our local food bank for holiday distribution. This afternoon, Still on the Hill performed at the Eureka Springs UU Fellowship, and Kelly Mulhollan signed copies of his new book, True Faith, True Light written about the instruments made by Ed Stilley. The instruments, as I've mentioned before are fascinating. Stilley was completely self-taught, using the tools that he had in his workshop, and had no training as a luthier, and no sense of what one might call "fine craftsmanship." On the other hand, he made over 200 unique instruments and gave most of them to children. Kelly and Donna performed on several of Stilley's instruments during the concert, and left them on display so they could be examined close up while they were busy signing books. Instead of trying to build guitars of a specific shape, Stilley had a bending jig that allowed the shape to be determined by what the wood was willing to do. He would boil it, put it in the jig, push it to its limits and then make his guitars whatever shape came as a result. That accounts for the unusual shapes and sizes. Pork bones were used for bridge and nut, and all kinds of resonating devices were added systematically on the insides, including old saw blades, door springs and the like. Sometimes hinges were used as end pieces for attaching strings, and 1/8 in brazing rod was used for fret stock. Most luthiers would regard Stilley's guitars as crude. For example, the holes drilled to form the peg box on the guitar below is very crudely done. Each of Stilleys' guitars would seem crude to those more familiar with manufactured models. On the other hand, they are outsider art and an expression of a unique creative passion. The lettering expressing Stilley's devotional message (True Faith, True Light Have Faith in God) was routed free hand using an old Craftsman router. As I've mentioned before in the blog, Ed Stilley is a treasure. And Kelly Mulhollan's book about his guitars and his devotion is beautiful. I should also mention that the timing of this concert and book are great inspiration for making cigar box guitars at the Clear Spring School, a project we will begin in greater depth upon returning from the holiday break. Make, fix, create, and extend to others the inspiration to learn likewise. Richard Bazeley sent photos of his current design project for 11th year students. They are taking sticks and dowels and making model chairs with the idea in mind of making larger chairs when the models are complete. The tools used are coping saws, knives, and a mini Veritas tenoner. 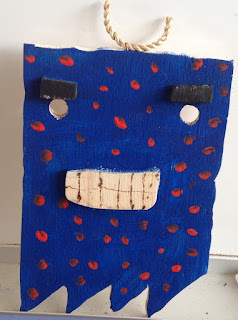 I like Richard's project because it is using materials from the local environment. Many design courses are dependent on foam core, a paper product with foam core, that inevitably ends up in landfills or floating in an ocean gyre. Taking sticks from the natural environment, and making use of them, removes carbon from the ecosystem instead of adding to the damage excess carbon is doing to the atmosphere. Years ago, publisher Robert Rodale had described the way handsomely made wood objects might serve as a carbon sink, sequestering carbon from the atmosphere. Design thinking should take all things into consideration and lead students to directly engage in consideration of the natural environment and to consider the consequences of their actions. At Clear Spring School, some of my students have begun work on cigar box guitars, by deciding on the shape box they will make for the body. It is easy to design things that can never be made. Designers have notebooks full of things that even the finest craftsmen would scoff at. To test your ideas in real materials should be an essential part of design thinking, and where those materials have physical attributes that offer additional challenges to the design process greater value is offered. To take sticks with all their inherent irregularities and make a chair is a good example. I have ordered 10 new rasps for my Clear Spring School classroom, so that students can shape the necks on their guitars. 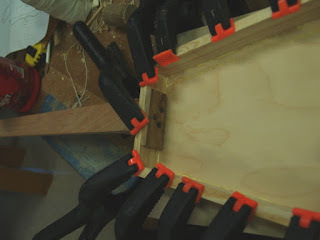 The last time we made cigar box guitars we used a router to shape the necks. This time, rasps will give the students more opportunity to mess up, but also more opportunity to learn from the materials, and to shape their necks in a more personalized and hand friendly manner. Shaping the necks will also be useful training for the hands in the perception of form. I'll start them by drawing lines on the neck and have them rasp flat planes between. These flat planes can then be rounded using a shoe rasp and sand paper, making the neck both symmetrical and comfortable to the hands. I marvel at Donald Trump's sense of superiority, and his display of egotism. Craftsmen, in stark contrast, are rarely enabled to go so far off the deep end. If we were to ever get carried away with our own sense of self-importance, some form of failure in the processes in which we are routinely involved will bring us safely back to earth without damaging the lives of others. On a positive note this week, scientists and citizens in almost 200 countries agreed on new measures to reduce greenhouse gas emissions, as a number of political and economic entities in the US continue to obfuscate the issue. It is time for that obfuscation to end if we are to deal with the real problems associated with global warming. At this point, nearly anyone who takes the time to observe nature can see that global warming is real and that it is having adverse effects on local climate. Here in Arkansas for example, we are suffering from the most beautiful days that could be imagined in December. Delight in warm temperatures is moderated by an awareness of the damages that are impacting the whole world and every species of plant and animal life within it. Donald Trump noted that he was against the Environmental Protection Agency because they mandated reduced flow shower heads that require him to spend more time washing his hair. Is it not time for such comb-over foolishness to be brushed aside from consideration? Make, fix, create, and serve the planet by helping others to learn likewise. I am finding myself at slightly loose ends, bouncing between the home shop where I've been working on boxes, and school where I've been making toys with the younger kids and getting ready for making 3-string box guitars. In the news, I have been deeply troubled by the rise of Donald Trump and the spewing of hatred and fear that seems central to his candidacy. When a sane person has gone to a candidate's rally, only to stand shoulder to shoulder with the KKK, it would hopefully make that person question his own judgement. There is a term in psychiatry that is useful in understanding Trump: Megalomania or Narcissistic Personality Disorder. In the meantime, the utility company that we battled over their plan to build an unnecessary extra high voltage power line through our home site has resigned from ALEC, a legislative affairs organization that in addition to writing legislation for Republican legislators has tried to caste doubt upon the validity of science. At this point, the greatest threat to our civilization is not terrorism, but the damage we have done and are doing to our environment by the burning of fossil fuels, so I am hopeful that AEP's termination of relationship with ALEC as being a good sign. On the other hand, AEP in Arkansas is considering burning forest resources as "biomass," claiming forests as "renewable." That is disgusting and immoral. Jimmy Carter as president had warned of the dangers of dependency on Middle East oil, and promoted the necessity of building an energy model based on wind and solar,. The Reaganites laughed at his sweater. But we cannot rewind the clock and lay claim to what we abandoned at that time. Americans invented the solar panel and then chose to let others lead the way forward, so that we could have a throw-away society and homes filled with meaningless things. In 2008, I went to a conference in Finland and I was reading through some of my blog posts from that time. They were rather well written, and so I suggest them as a journey back. You can find those posts here. Those posts are in part related to the ritual expressions of caring hands, and rebellion against throwawaysim. The coiled rope illustrates the kind of care that one can express through the hands. Why take the time to coil a rope? 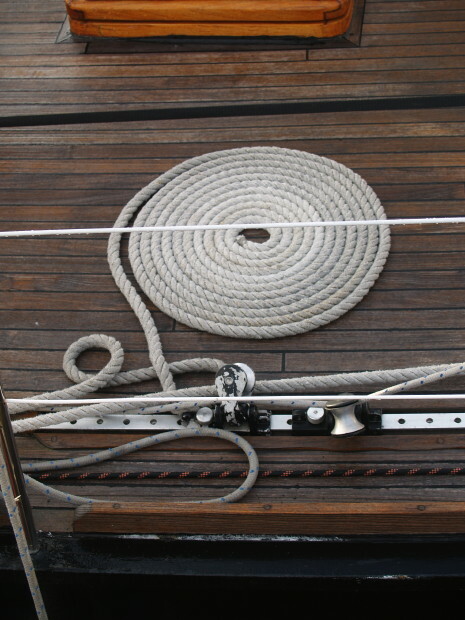 First, it has a practical value in that a coiled rope is less of a tripping hazard. 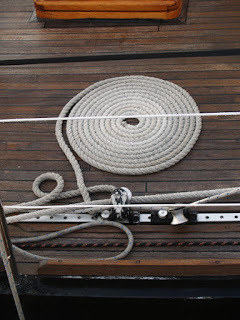 It also expresses caring and is a reflection of the crew's pride in their boat, their seamanship and in themselves. In the meantime, a report on charter schools describes them as a gravy train for investors. Today in the wood shop, I plan to clean and continue making boxes. I went to the Clear Spring pre-school yesterday afternoon to help the students drill holes in wooden presents for their parents. 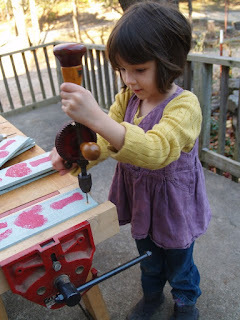 It was their first time to drill holes, and an excellent time to begin learning of their own creative powers. I also finished a box guitar, and spent just a bit of time in the shop, sanding the underside of panels for box lids. In school, my older students worked on turning cherry gavels, finishing bows and making a bunk bed for fairies. In the meantime, it is important to have lofty goals beyond test scores, reading comprehension and grades, for schooling should least in some measure concern itself with the making of the men and women for the future of the human race. What are we to become? Froebel believed that children should be assisted and encouraged toward an ideal that I believe would resonate with modern psychological therapists. The term that Froebel used was Gliedganzes, which meant member-whole. By the use of this term, Froebel described human beings as being both individual members of the human race, and connected to the human archetype as an embodiment of the whole. And so while a child might display signs of personality and variance, within that child was also the potential of expressing the ideal of our human spirit. The longer we reflect upon Froebel's definition of man as Gliedganzes the more suggestive it becomes. Concentrating attention first upon that phase of the definition which affirms that each man is ideally mankind, there dawns slowly upon us the vision of mind as a generic and therefore self-creative energy. We picture to ourselves a musician, who is also the instrument he uses and the symphony he plays; a sculptor, who is himself the clay he models and the statue he produces; a master-builder, who is also the quarry whence comes his marble and the temple he rears. Then, as our thought grows clearer, we throw away our pictures of the unpicturable, and, gazing directly upon the miracle of mind, behold an energy which, acting upon itself as material, realizes itself as result; an energy self-impelling, self-fulfilling, and selfrevealing; an energy which starting from itself returns to itself only to be incited to fresh wanderings which culminate in deeper returns; in a word, an energy which, in the most literal sense, "is what it makes itself to be "—a self-product. Very wonderful is this vision of mind, but we may not dwell upon it, for the Gliedganzes has other secrets to reveal. It is the paradox of mind, that while free and self-creative it yet implies relationship. It is independent but not solitary. To be social is its nature, and a mind existing apart from and out of relation to other minds is a logical impossibility. Indeed, mind is in no sense a possession of the individual, but a universal energy in which all individuals participate. As Dante teaches us in the Purgatory, spiritual energies grow by giving, by spending are increased, and in the distribution of spiritual food the miracle of the loaves and the fishes is perpetually renewed. The more thought communicates itself, the more truly it possesses itself; the more completely love loses itself in its object, the more surely does it find its own fulfillment. Only through membership and the communion which membership implies does man make actual his ideal nature; only in so far as he becomes universal is he in any true sense individual. – Susan Blow, Symbolic Education. We are down to 14 days of making time before the Christmas holiday, but the season of giving is more than just one day. If you've run out of time to make, and would like something made by a real person and from real wood, Shop my Etsy store. Delivery by priority mail in 1-3 days. Last night I finished the nut, and bridge for a box guitar I am calling the "rustic wonder" and during the day, I started another cigar box guitar as a demonstration for students so that they will know how to make the box for their own. During the day I was reminded of three friends. In the truck I've been listening to a CD of rock music by my friend Mario and his band in Buffalo. Mario is undergoing treatment for cancer and this should be his last week of chemo and radiation. I was introduced to making musical instruments as an educational device by a good friend Roger Dale, who had been art teacher in Berryville, Arkansas when I first moved to Eureka Springs. He coached me as I made my first dulcimer. From that starting point I began making just a few of them for sale in my own wood shop. Roger is now suffering from Alzheimer's in Wichita, Kansas. I have a recent photo of him on my desk to remind me of our great friendship and what he and his family are going through now. I also got a call from a friend who is now 91 years old and has moved to Texas to be with his son and daughter. He had lived over 60 of his years in Arkansas and misses this place, but aging and the loss of his wife has made him dependent on his family. In any case, time marches onward, and we must celebrate each day we are able and bask in creative light. I attempt to keep this blog out of politics, knowing that there would be readers from both sides of the political divide who need to know about and consider the essential role that the hands play in the shaping of character and intellect. But is it particularly disturbing to me to see an absolute nut running for for the Republican nomination for president, and worst is that he is having such success at gaining Republican support by saying such hateful things. The more pernicious his remarks, it seems, the more support he receives. First he directed his malicious comments to Latin immigrants, and now to Muslims. In the past, successful candidates have served as bridges and strings, with philosophies reaching out to span the full instrument of American culture, and to embrace the diversity of our people. Trump is like a train wreck in slow motion. We can't help but watch wondering who he will insult next and how high his inflated sense of self-righteousness will soar. The nut is actually a small but important part of a musical instrument. It is what supports the strings at just the right height above the fret board and positions them as they pass to the bridge that communicates their vibrations into the body of the instrument. Big nuts in American politics we can do without. Kareem AbdulJabbar wrote a great editorial on the Trump candidacy here. I can explain exactly how the deficiencies of American educational policy play out disastrously in Trump's success as a candidate. In the meantime, we have 15 making days until Christmas, and if you need presents for this holiday season and have no time to make them yourself, check out my Etsy store. On another note, Obama signed a new education bill into law today, replacing "No Child Left Behind." The new law is called the "Every Student Succeeds Act." Let's hope that with this act, government gets out of the way of student learning and allows the real success students can earn by doing real things. Make, fix, create and insist that others learn likewise. As you see in the photos I made some progress yesterday in my demonstration model cigar box guitar. My students will be given the choice of whether to make their guitars with or without frets, and with a box of their own design. This guitar, I have named my rustic wonder. The body is nailed together spruce sawn from 2 x 4 lumber. 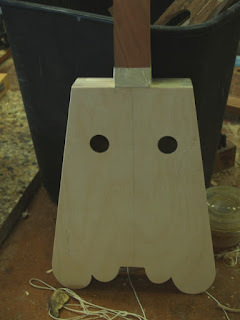 The front and back are basswood, and the neck is cherry. In the lower image, I've applied two layers of milk paint, brown then blue, and then a bit of green and red around the sound hole. When sanded one color slightly reveals the color beneath for a more mottled and interesting effect. Below you can see the guitar with the body painted using milk paints. A final coat of waterbased urethane will complete the finish and enrich the colors used. With the tailpiece made, and the tuning peg holes drilled, all that remains will be sanding and oiling the neck and adding the bridge, nut and strings. One of the great things about teaching is the opportunity to explore, learn and prepare. If we want our children to be creative, teachers must model creativity and be given the opportunity to be creative, whether in the form of lesson plans designed with their very special kids in mind or in making tangible and intangible useful and lasting beauty. John G. sent a link to an article by a teacher who was required to give her 8 year-old students iPads. I have an iPad, and I know how useful they can be. But for children who already spend too much time watching screens and avoiding actual social interaction, schools should provide shelter from too much engagement in digital media. The OECD in their study of the application of digital media in schools learned that: "even countries which have invested heavily in information and communication technologies (ICT) for education have seen no noticeable improvement in their performances in PISA results for reading, mathematics or science." In other words, its not working folks. On the other hand, we do know that making things of lasting beauty, through which mind and hands are harnessed in service to each other, works. 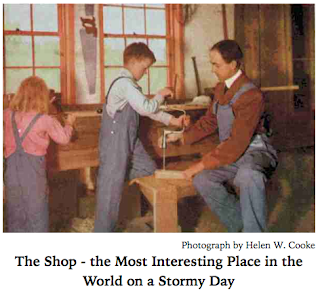 We need to bring back wood shops, music, the arts and laboratory science to our nation's schools. I will remind my readers that we now have 16 shopping days until Xmas, and plenty of time for me to ship orders from my Etsy store. Last week I mentioned my student who wanted to make a guitar, and my misunderstanding of her intentions. She had seen the cigar box guitar made by one of my high school students a few years back that I had brought out for the sake of discussion with my upper school students, and insisted, "I want to make one of those." As I was trying to talk her out of trying such a difficult and complex project as a real guitar, she asked if she could use particular pieces of wood, and before I knew it, she had begun. I had to interrupt when she began using a sloyd knife to cut the sound hole in the front. I set up the drill press and used a circle cutter while she watched. She finished her guitar yesterday during class, and it is truly a class act as you can see. I have never seen a happier guitar. Even the back was decorated with smiling faces. Yesterday I made the neck for my demonstration cigar box guitar, and attached it to the body that I showed in yesterday's post. Today I'll glue the front on, make the tail piece to attach strings and drill holes for tuning pegs. I hope to launch my older students on a similar adventure in January, and am using this guitar as a model and practice for the making of theirs. For our cigar box guitars we will be making our own boxes. From Australia, I offer another example of student work. One of Richard Bazeley's junior classes is making masks using thin plywood, off cuts, hand tools and paint. We have 17 making days until Christmas and you've plenty of time to shop at my Etsy store. Make, fix, create, and insist that others have the opportunity to learn likewise. To Froebel the most interesting correspondence between the unfolding of thought and the growth of plants and animals lay in the characteristics which constitute the very idea of development. Comparing the mind of the young child with that of the mature and educated man, we find that the former has few ideas, and that such as he has are abstract, indefinite, and held in isolation the one from the other; while the latter not only possesses an infinitude of particular thoughts, but has articulated these thoughts into a systematized unity. In like manner, organisms develop by an advance in structure from the homogeneous to the heterogeneous, their growth beginning in the differentiation of an originally uniform germ, and through a continuous repetition of this process completing itself in the production of a membered totality in whose maintenance an almost countless number of organs find their own fulfillment. In other words, as thought unfolds by dissolving an ever-increasing multiplicity of differences into a higher unity of self-consciousness, so an organism develops by "working out diversities of member, form, and function, and at the same time in the very act of differentiating, reintegrating its diversities into the common unity." To this correspondence Froebel is perpetually recurring, and occasionally his manner of stating it gives color to the idea that he borrowed the law of development from Nature, and, making the "tree his tutor," learned from physical organisms how to aid the mind in its struggle to become actually what it is ideally. But the careful study of Froebel's works revolutionizes this opinion. He was not one of those who love to find "natural law in the * See Caird's Philosophy of Religion, p. 108. spiritual world," but rather one who only cared for Nature because he had penetrated her disguise and beheld in all her varying forms the shining lineaments of mind. "There exists no other energy," he once said," but that of thought. The law of thought is the law of the Cosmos." * And, again, he wrote to Krause, the philosopher, "I consider the movement from analysis to synthesis, which I find in pure thought, as the type and law of all development." The practical bearing of the thoughts just considered is obvious. If education is to conform to the natural process of development it must seek in childhood to quicken sympathy and enlarge the range of perception. It must aid the boy to find the relations between observed facts, while to the youth it should reveal the unity underlying these relations, and gradually lead him in each department of study to "see the whole in the part." This was of course, the kind of language that befuddled those who wanted education to stick to the facts, convey nothing but the facts and for education to ignore the natural development of the child. I am interested in having my students make a variety of wooden musical instruments, and so have begun making a funky cigar box guitar as shown in the photo above. The frame is made of pine cut from a 2 x 4 and the top and back panels are glued up from resawn basswood. There are 17 making days left before Christmas. If you have gifts to give for any of the holiday occasions, and are running out of time check out my etsy store here. a day in the wood shop. Yesterday in the wood shop, I made veneered top panels for boxes. It felt great to have a day to spend quietly assembling veneers into patterns that might look good on the top of a box. These designs were achieved with a mix and match veneering technique in which veneers of various colors are stacked, cut apart, reassembled, and then cut again. 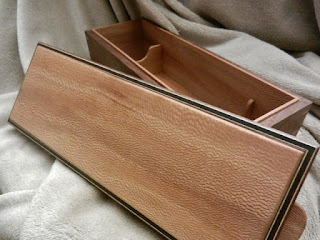 This technique assures that no two boxes will be exactly alike, and unlike laser veneer work, allows your skill and attention to come into play. The top panels shown at left will add visual interest to finished boxes. At Clear Spring School I have the luxury of working with all grade levels from pre-school through high school, so have the opportunity to observe child development over an extended range of ages. I also have the luxury of having worked with some of the students I have now all the way from first grade to high school. So while other teachers and administrators have come and gone, I tend to be one of the fixtures of stability and insight. On Wednesday, I got out a student's unfinished cigar box guitar with the intention of discussing making musical instruments with my upper level classes. June, a second grader, saw the guitar and insisted that she wanted to make one. Oen had seen the older children at work on bows, and insisted that he needed to make one of those. He had been searching through the wood scraps for weeks looking for a piece to use for a small bow. At first, I tried to explain to Oen and June that these projects were for the older kids, and that the guitar involved so many steps that had to be performed in a certain order. She asked if she could have this piece for the neck and that piece for making the body. She insisted that a hole had to be drilled "right there." As she had seen me do, she used a small paint can to trace the shape of the hole. When I tried again to explain the complications involved, she climbed up on a stool, at the work bench and with a sloyd knife and awl began trying to dig a hole through the board. What I had forgotten was that for many young children the symbol of the object may have as much power as the real object itself. While I was trying to explain to June how difficult it is to make a guitar, I was looking at the guitar from my perspective based on the experience of making musical instruments. From hers, a guitar was simply an object to hold and strum, and whether or not it makes sounds at the right pitch, or even makes real sounds at all, was beside the point. Oen, having selected a thin piece of white oak for his bow, asked that I string it for him. At that point, it was nothing more than a strip of white oak that he could bend in his hands. I asked him how I was to string it if it had no notches at the end. "What do you mean," he asked. "Go look at a bow that one of the older students is making," I suggested. Looking across the room, he saw immediately what I had in mind. It was a thing he had never observed before. He cut notches with a hand saw, I added the string, and with a dowel for an arrow, he had a working bow that gave him hours of enjoyment. And in all that was the opportunity for me to witness and better understand how children grow. And that, my dear friends is how it all worked before standardized testing came to the fore, and teachers were no longer trusted to assess growth and children were never allowed to do real things. My wife and I went to the little craft show in Fayetteville, Arkansas last night. I was lured there by the opportunity to see old friends that have their work in the show. I was pleased to discover that there were so many young people involved. By that I was reminded of my own first shows as a craftsman and how much my work has progressed over the course of 40 years. I was not surprised that so much work would be produced by computers or assisted by computer aided design. In the old days of craft fairs if there were cards for sale, they were hand-crafted and drawn in calligraphic stokes, real pen, and real ink on paper, and that, too, was often hand made. These days, that's not often the case. My wife bought a 3-D printed cake topper, and as I examined it, I knew that although it was a good product, there were no traditional crafting skills involved. The only engagement of the hands required were to peal it off the bed of the printer and put in its lovely package. And that, I hope is not indicative of the direction that American Crafts must go. Surely there is more to the movement than that. In my shop, I am working on the top panels for 32 boxes. Some of the panels were demonstration panels from an ESSA class I taught last summer. Those I am installing in the recently made boxes, as shown in the photo above. More veneered panels will have to be made. And my purpose, of course is to simply keep engaged in the process of making. Some, when they are finished will be offered for sale through local galleries and through Etsy. In the formative instinct of childhood Froebel discerned an analogous attempt of mind to stamp itself upon its environment. The child is constantly trying either to change something or to make something. This persistent effort hints to us that mind is something more than an intellectual stomach. Knowledge is food, but creation is life, and we do not live to eat, but eat to live. Even as I write, I am conscious of stating a half truth. For if it be true that himself as in a mirror. Creation, therefore, culminates in revelation. Froebel never loses sight of these two aspects of mind; and if he tells us that "man made in the image of God must from the beginning of life be conceived and treated as a creative being," he insists with equal force that "to become conscious of self is the first business of the child and the whole business of man." The craft show was a reminder for me that we must never worry about the loss of the human inclination to make. It seems to be inherent in the nature of man to do so. On the other hand I am a bit worried that computers have made many things much too easy. The most difficult and challenging things we do are ones that stick to the ribs, build mass in the structure, create wisdom in the mind and hands and create momentum for the journey forward in the development of craft. Geoffrey Chaucer had said, "The lyf so short, the craft so long to lerne, the' assay so hard, so sharp the conqueryinge." But if things are made too easy, how will young people draw satisfaction at the deepest levels. Yesterday, a group of my older students gathered in the wood shop during lunch, asking that they be allowed to stay. They insisted that they preferred the wood shop to the playground, and they each had goals to accomplish that required tools and the space to work. As I was working on other things, and not watching the time, I allowed them to stay until recess was over and their teacher came looking for them. I insisted they not miss geography. The following is from Susan Blow's Symbolic Education. The most obvious correspondence between the unfolding of the mind and the growth of organisms is that in both the condition of development is exercise of power. Use and disuse, long since recognized in the parable of the talents as the sources of spiritual gain and loss, have in our day come to be insisted upon as the sources of all gain and all loss. Use gives the blacksmith his brawny arm, the musician his nimble and flexible fingers, and the thinker his power of marshaling at will the battalions of his ideas. Disuse takes from the caged bird the power of flight, from the sedentary student the vigor of his limbs, from the man who indolently refuses to think and act the power of thought and action. Pestalozzi struck the keynote of educational reform when he wrote, in the Evening Hour of a Hermit: "Nature develops all the powers of humanity by exercising them; they increase with use." In the formative instinct of childhood Froebel discerned an analogous attempt of mind to stamp itself upon its environment. The child is constantly trying either to change something or to make something. This persistent effort hints to us that mind is something more than an intellectual stomach. Knowledge is food, but creation is life, and we do not live to eat, but eat to live. It is fascinating how little time in most schools is devoted to our children's creative and formative capacities. The old saying, "use it or lose it" applies. Yesterday in the wood shop I spent just a bit of time assembling boxes. Where I will sell all these, I've no clue. With the boxes formed, I can begin crafting decorative veneered panels for the tops. At Clear Spring School several of my students are finishing their bows and arrows, and one of my second grade students insisted on making one, too. We are also making toys for the local food bank as we often have at this time of year. The following is from Susan Blow, Symbolic Education. The greatest mistakes in education are rooted in the failure to recognize and conform to the different stages of natural development. Educational theorists are constantly pointing out this error; educational practice is constantly repeating it. Notwithstanding all that has been said and written, we still make knowledge our idol, and continue to fill the child's mind with foreign material, under the gratuitous assumption that at a later age he will be able, through some magic transubstantiation, to make it a vital part of his own thought. This is like loading his stomach with food which he can not digest, under the delusive hope that he may be able to digest it when he is a man. It is forcing the mind to move painfully forward under a heavy weight, instead of running, leaping, and flying under the incitement of its own energy and the allurement of its own perceived ideal. Thus to load the young mind is a grievous sin; but we commit a yet more heinous offense when we insist upon the exercise of faculties whose normal development belongs to a later age. The child is sympathetic, perceptive, and imaginative, but he is incapable of sustained observation and repelled by analysis and logical inference. The very flowers he loves so dearly become mere instruments of mental torture when we constantly insist upon his analyzing and classifying them. The attempt to force a premature activity of reason can result only in the repulsion of his sympathies and the stultification of his mind. It is odd that when it comes to children taking their first steps, it is acceptable to parents and pediatricians that those steps be taken at 11 months. It is equally normal that first steps be taken at 15 months or later with pediatricians claiming no indication of abnormality. But if a child is not reading and doing math on schedule, teachers and parents are launched into conniption fits. Parents and teachers know that when a child walks is not a thing under external control so they are willing to surrender at least that to the child. We would be best advised to also understand that the exact timing of when a child is developmentally ready to learn other things is not subject to exacting external control either.We would do well to listen to the advice offered in the 19th century and pay better attention to the developmental needs of each particular child. By not paying attention to the different stages of natural development and by applying too much pressure to learn, schools do much more harm than good. So what should children do in school? We must restore play and playfulness to the heart of it. Make, fix, create and attend to the necessity that others to learn likewise.